Dining on field grasses would be ruinous to human teeth, but mammals such as horses, rhinos and gazelles evolved long, strong teeth that are up to the task. New research led by the University of Washington challenges the 140-year-old assumption that finding fossilized remains of prehistoric animals with such teeth meant the animals were living in grasslands and savannas. Instead it appears certain South American mammals evolved the teeth in response to the gritty dust and volcanic ash they encountered while feeding in an ancient tropical forest. The new work was conducted in Argentina where scientists had thought Earth’s first grasslands emerged 38 million years ago, an assumption based on fossils of these specialized teeth. But the grasslands didn’t exist. Instead there were tropical forests rich with palms, bamboos and gingers, according to Caroline Strömberg, UW assistant professor of biology and lead author of an article in Nature Communications. To handle a lifetime of rough abrasion, the specialized teeth – called high-crowned cheek teeth – are especially long and mostly up in the animals’ gums when they are young. As chewing surfaces of the teeth wear away, more of the tooth emerges from the gums until the crowns are used up. In each tooth, bone-like dentin and tough enamel are complexly folded and layered to create strong ridged surfaces for chewing. Human teeth have short crowns and enamel only on the outside of each tooth. In Argentina, mammals apparently developed specialized teeth 20 million years or more before grasslands appeared, Strömberg said. This was different from her previous work in North America and western Eurasia where she found the emergence of grasslands coincided with the early ancestors of horses and other animals evolving specialized teeth. The cause and effect, however, took 4 million years, considerably more lag time than previously thought. The idea that specialized teeth could have evolved in response to eating dust and grit on plants and the ground is not new. 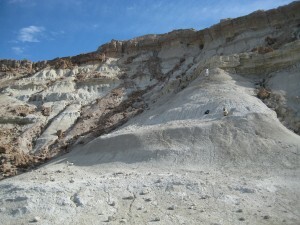 In the case of Argentine mammals, Strömberg and her co-authors hypothesize that the teeth adapted to handle volcanic ash because so much is present at the study site. 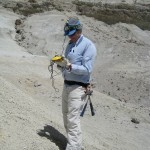 For example, some layers of volcanic ash are as thick as 20 feet (six meters). In other layers, soils and roots were just starting to develop when they were smothered with more ash. Chewing grasses is abrasive because grasses take up more silica from soils than most other plants. Silica forms minute particles inside many plants called phytoliths that, among other things, help some plants stand upright and form part of the protective coating on seeds. A phytolith, this one from a grass, range in size from 5 to 250 microns and vary in appearance depending on the kind of plant they come from. 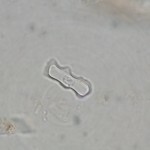 Phytoliths, these two from a palm tree, are microscopic bits of silica that that are all that remain of plant tissue once the plant dies and decays. Phytoliths can remain in soils for millions of years as a record of what kind of plants grew at a site. 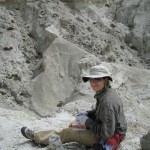 University of Washington paleontologist Caroline Strömberg collects samples in Argentina that will be analyzed in her lab looking for phytoliths, the microscopic remains of ancient plants that remain in soils for millions of years. University of Washington’s Regan Dunn relies on a GPS device in the course of sampling every three feet (one meter) up the 350-foot face of Gran Barranca, Argentina. 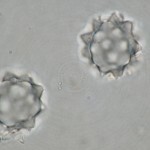 Phytoliths vary in appearance under a microscope depending on the kind of plant. When plants die and decay, the phytoliths remain as part of the soil layer. In work funded by the National Science Foundation, Strömberg and her colleagues collected samples from Argentina’s Gran Barranca, literally “Great Cliff,” that offers access to layers of soil, ash and sand going back millions of years. The phytoliths they found in 38-million-year-old layers – when ancient mammals in that part of the world developed specialized teeth – were overwhelmingly from tropical forests, Strömberg said. “In modern grasslands and savannas you’d expect at least 35 to 40 percent – more likely well over 50 percent – of grass phytoliths. The fact we have so little evidence of grasses is very diagnostic of a forested habitat,” she said. The emergence of grasslands and the evolution of specialized teeth in mammals are regarded as a classic example of co-evolution, one that has occurred in various places around the world. However, as the new work shows, “caution is required when using this functional trait for habitat reconstruction,” the co-authors write. Other co-authors are Regan Dunn, a UW doctoral candidate; Richard Madden, University of Chicago; Matthew Kohn, Boise State University; and Alfredo Carlini, National University of La Plata, Argentina.